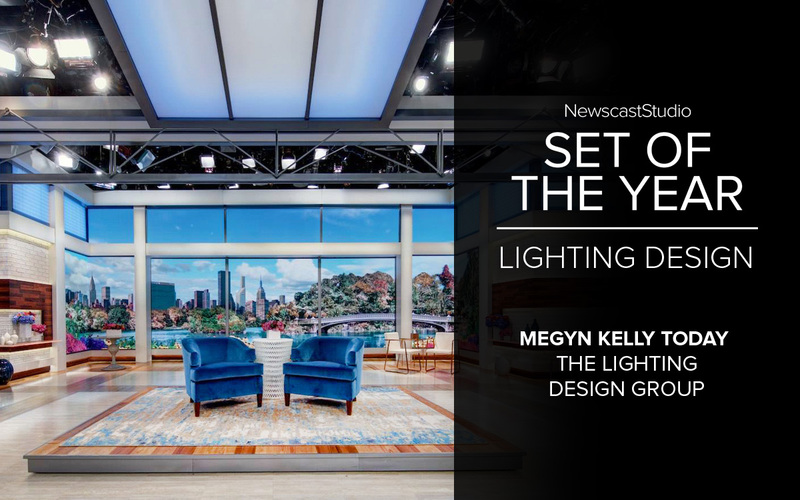 In the national lighting design category, The Lighting Design Group’s work for NBC News‘ “Megyn Kelly Today” received top honors. 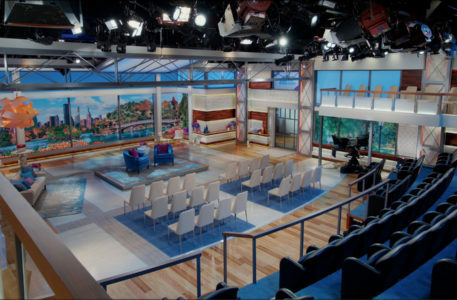 Located in Studio 6A, the lighting design for “Megyn Kelly” included creating a flexible lighting setup that interacted with a variety of textures, finishes and LED video walls as well as the studio audience area. 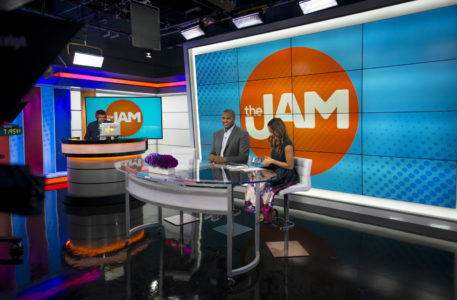 Honorable Mention: “The Jam” on WCIU with lighting design by FX Design Group, WFMZ lighting design by Devlin Design Group and “TRL” lighting design by The Lighting Design Group. 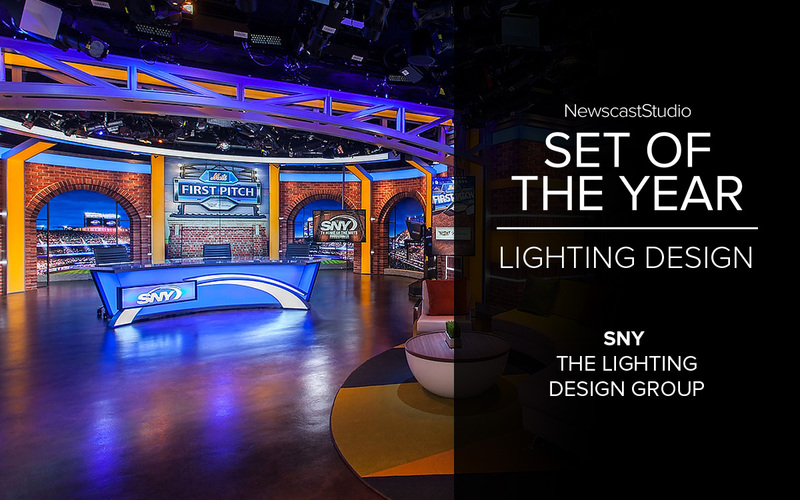 New York City’s SNY’s multiple sets, with lighting design from The Lighting Design Group, stocked full of video walls and panels designed to serve as both faux windows and flexible background modules has been honored with this year’s local lighting design honor. 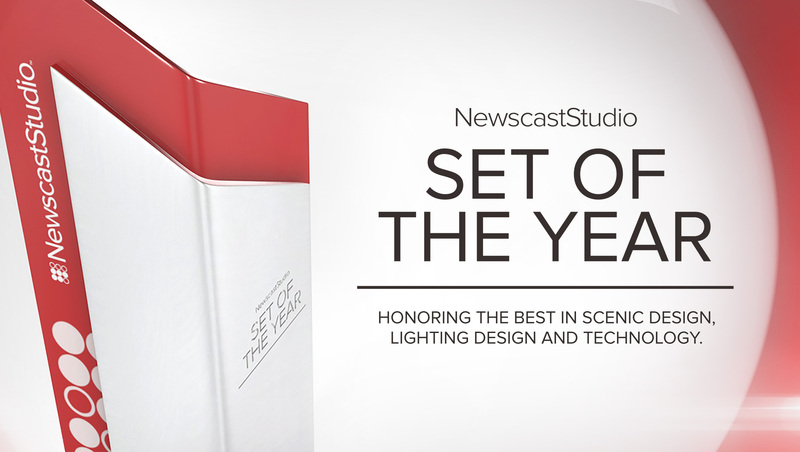 The fan vote category allows NewscastStudio readers and station viewers to vote for their pick for Set of the Year. This category is ranked separately from the judge’s scores and the fan vote does not include craft categories of lighting design and set technology. 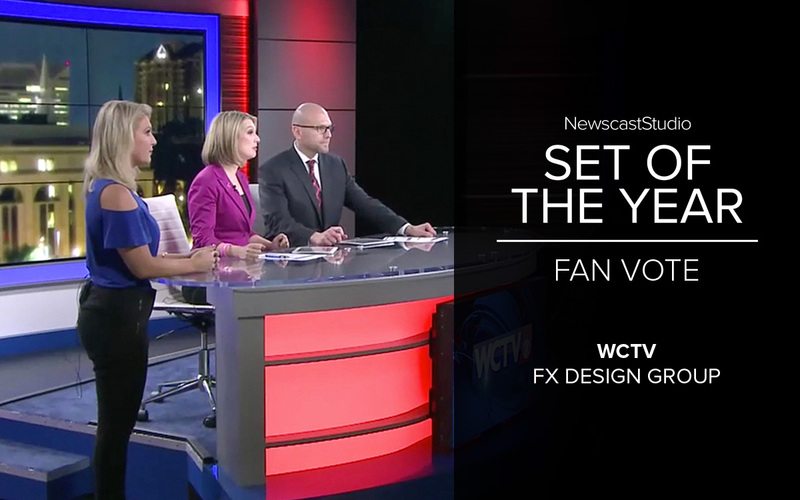 This year, FX Design Group won the fan vote for its design at WCTV in Tallahassee, Florida. This clean design combines a large video wall background along with bold backlit surfaces and additional monitor arrays in the weather center. Each of the winners will be honored with a custom designed metal trophy. 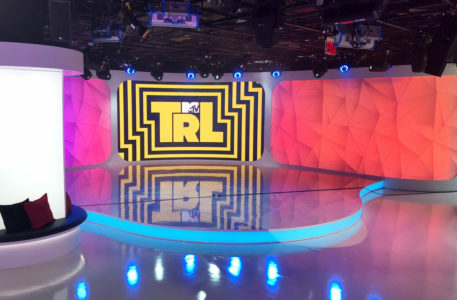 The Set of the Year competition, in the ninth year of honoring the best in broadcast design, has quickly become one of the top and most coveted honors in the broadcast design industry and its winners often foreshadow work that goes on to win other recognized awards. As a two time PROMAXBDA Award winner with fifteen years of design and technology consulting experience, Ronen has curated a strong company portfolio and relationships with a long list of clients. Working from the perspective of an architect, but in touch with digital media branding and the latest innovations in broadcast technology, he is the Creative Director for Full Mental Jacket, located in Burbank, California. 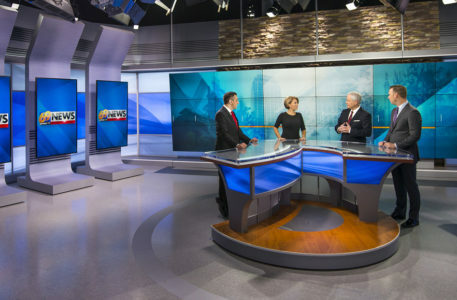 FMJ is a one-stop shop for broadcast clients looking to integrate cutting edge realtime graphics, Virtual Reality and Augmented Reality technologies into their productions. As CMO of FLUOTEC, we design & manufacture a complete line of lighting luminaires for Television Studios. I am responsible for leading the international sales and market positioning strategies for FLUOTEC´s Television, Theater, Video, Photography and Cinema LED lighting products. Creative Director and Branding consultant specialized in media and commercial advertising, working for Al Jazeera for more than 17 years, worked in Operation department as studio directors from 1999 till 2010, directed many TV shows and corporate films. Now leading creative and art production for AL Jazeera Media Network. Lori Agostino is a Production Designer living and working in Hollywood. She started her Film career in VFX working at Digital Domain building models, but soon realized she was destined to move into the Art Dept. She is currently a Member of The Art Directors Guild, I.A.T.S.E. Local 800, as well as a member of the Academy of Television Arts and Sciences. She is also a Gallery represented Painter and exhibits throughout the world. Kathryn Mosher-Boule’ is a design consultant with the experience and background of collaborating with TV stations for almost 20 years. Most recently with LIN Media and subsequently Media General as Manager of On-Air Image and Design – she has directed numerous Set/Lighting/Graphic re-brands. Prior to that, she worked with hundreds of stations with FX Design Group as VP of Business Development. Kathryn works with News Stations guiding the creative process throughout, managing construction and production timelines and facilitating creative problem solving, leading to successful implementation. 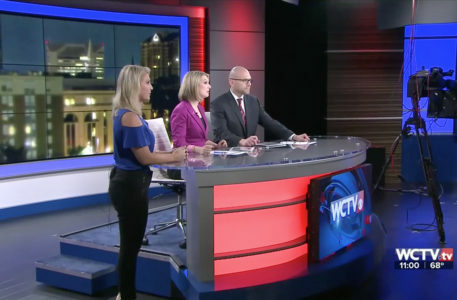 Results include designs that have been nominated, or won Emmys and Broadcast Design Association Awards. Hothaus is an internationally-recognized design and production company providing creative solutions for the television and film industries. Paul Babb is president and CEO of MAXON Computer and a graphics software technology authority with more than two decades of direct industry experience in the 3D animation, visual effects and motion graphics industry. Under Babb’s leadership, Cinema 4D, the company’s flagship product, is heralded as one of the fastest growing and most widely used 3D products for digital content creation. Babb is noted for his unlimited creative energy, progressive stance on product development and customer service, and support for 3D education. Mark has spent the last twenty-five years in the music industry, both on the Label side, as well as a dozen years licensing News Music, Production Catalogs and Custom Music for our clients in the broadcast world. Its always a pleasure working with our clients to give them the perfect music solution. I particularly enjoyed the process of judging the sets for this year’s Sets of the Year event. All of the sets look amazing, and I’m sure the nominees are very proud of their new look. Jordan serves as Creative Director for Turner Sports, overseeing creative design for the “NBA on TNT,” “MLB on TBS,” eLeague and various other sports properties. Jeff is responsible for the management of the Creative Services, Design, Commercial Production, Community Affairs and Production departments at the Meredith duopoly in Atlanta. Before joining Meredith he spent 17 years with the Cox Media Group in San Francisco & Charlotte. He’s been awarded numerous industry awards, including: Promax Gold, Regional ADDYs, NATAS Emmy Awards, Crystal Awards and Telly Awards. He’s also served on the volunteer leadership teams for Go Red for Women and JDRF.